Expectations....Oh How They Can Mess Things Up! Expectations – Oh How They Mess Things Up! Carolina enjoying a walk with one of her Fjords at my German clinic. It happens to the best of us. It happens in all sorts of situations. It happens when we go and take a clinic. It happens after a hard day at work. On the evening lecture before my clinics I always ask the participants to introduce themselves so I can get to know them and their horse a bit better. I also ask what they hope to get from the clinic and what they would like to work on. And I try to help those wishes come true but in reality, it rarely happens! Why?? Well I think it is because we are always having expectations put upon us. This has been going on ever since we were little. We are never (or rarely in my generation) allowed to just enjoy the moment and be pleased and appreciate our little successes. We always want the big successes but without the little ones we can never get to the big ones. My clinics focus on being present and for many people it is hard to quiet your mind and let the world around you go away for a short time. To enjoy being with your horse and appreciating the communication that is trying to happen between horse and human. To be able to notice the small things one must be present and relaxed. This is the part of the work I love, when the world goes away and I can dance with my horse – each of us making suggestions as to how and where to go – each responding with yes or almost or maybe in a bit. My horse appreciates being heard ad I appreciate his listening to me – an intimate conversation. I have been away teaching and I love to teach but I also love to be at home. 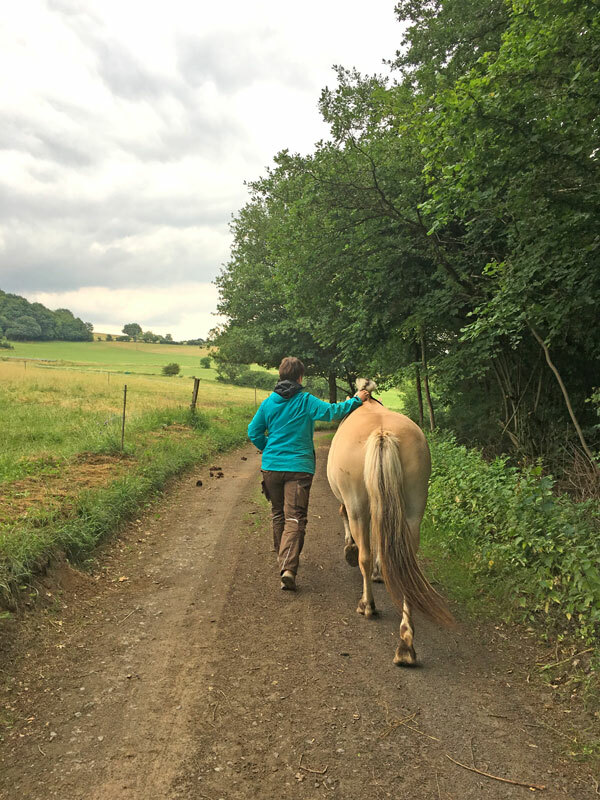 I am usually quite ok with doing whatever my ponies decide when I come home after being away but this time was long and I really didn’t get a pony fix while I was away and the weather was so nice – and so go the reasons we all give when we have expectations. Well I expected to go for a nice ride outside. I really wanted to go for a tiny ride just around the property. Simply to enjoy being home and out and with my favourite Icky. But Icky wanted to play inside, he wanted to show off and thrill me with all the things he does that he knows makes me smile and giggle and tell him he is so very special. So we played for a bit but I really wanted to just ride. I had expectations! Funny as I have heard those words from so many of my boarders and folks in the clinics over the years and tend to suggest that perhaps right now might not be a good time, that other ‘play’ might work better in this moment. We went to the mounting block outside and Icky really didn’t stand well, but I wanted to ride. He turned and looked back at me as if to say – hey mom why aren’t you listening? I had a choice to make. We could go for a walk with me riding and neither of us would be having a good time, or we could both walk and enjoy our time together. What if this were the last time we ever got to be together? I would like to be able to look back with fond memories, not with regrets. So we both went for a little walk. I walked and so did he. We stopped so he could enjoy some grass along the way and we both got to enjoy the wonderful day. Simply enjoying being home and out him, which is all I wanted. I just had to change my expectations. Tomorrow I will ask the question again and see what the answer is, and be happy with the answer because in the end I want good memories and you never know when it will be the last memory you have.